Exotic black, and red sand beaches are highlights of this 6 day Galaxy cruise, as well as the double-bay overhead views at Bartholomew and impressive Chinese Hat. 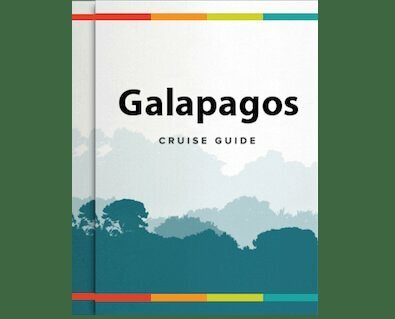 The Eastern islands are famed for the density and variety of wildlife they host compared to the rest of the Galapagos, and this itinerary lets you see and do it all. After lunch your first visit is to Black Turtle Cove which is situated in northern Santa Cruz. This bay is surrounded by mangroves and is accessible by dinghy only. The superficial cove is a safe refuge for marine life. Black-tip reef sharks, marine turtles, and a variety of rays are often spotted here. This visitor site is located on the east coast of Rabida Island and consists of a red sand beach, coastal lagoon behind the beach, and a loop trail. The approximate distance of the trail is 1.1 kilometers. The color of the rocks and sand on the beach is due to the very porous volcanic material, which with the help of environmental factors (rain, salt water and sea breeze, has acted as an oxidizing agent. The main attraction of the place is the red sand beach, scenery, aside from the vegetation of the arid zone and the presence of native and endemic species. Sombrero Chino is a small islet located near the southeast coast of Santiago. It is shaped like a Chinese hat when seen from afar and is an island consisting of a "splatter" type cone (lava ejected as it dropped and fells close to where it came from, which forms an indented cone) that forms the summit and many lava tubes that go down to the coast. On the west you can see pillow-type lava formations, which are an indicator that the flows were formed under the sea and have been raised upward, which is why coral heads are found on the lava. This visit provides an excellent opportunity for the interpretation of geological features such as lava tubes and lava flows. The trail is 700 meters (round trip) and the minimum time it takes to embark this trek is half an hour. This island was formed by the lifting of marine volcanic lava. Marine fossild were found on this island; the fossild date from the Pleistocene Era. In 1932, Capitan Alan Hancock and his crew took 72 land iguanas from Baltra Island and introduced the on North Seymour Island. The reason for this change was because the iguanas could live in better conditions here than in Baltra. The vegetation of North Seymour is bushy and hosts nest of Galapagos frigate birds. This islet is located between Baltra Island and North Seymour. Here, find the biggest sea lion colony; also it is possible to observe several species of birds. Enjoy its white sand beach. All the roads and the island overall is composed of lava flows that still exist virtually without erosion and they cover an extensive area. Find lava pohoehhoes, hornitos, and mollugos, a plant that grows in the lava. These are lava colonizers. Snacks and refreshing beverages will be available. Walk a path to the top (114 m) and see pioneering plants such as Tiquilia, Chamaesyce, and Scalesia in this place. The island is formed by cones and pipes of lava from where lava flowed. Then take a wet landing path to the south beach through mangrove swamps and dune vegetation. Here, go swimming and snorkeling. From the top of the island Bartolome, you will be able to observe the islands such as Santiago, Rabida, and Isabela in the distance. You might also find penguins at Pinnacle Rock! Here, have a walk on Barranco path. Observe tropical birds, petrels, common frigates, red-foot boobies, mask boobies, doves, and finches. Experience beautiful coral beach! Genovesa is a small island situated to the north of Galapagos. Near the beach we will find a small forest of mangrove swamp where we will discover a colony of Frigates, marine iguanas, red footed boobies and mask boobies, the great terrestrial finch, seagull, herons, and cactus finches. After this land visit, have the option to go swimming in the bay. This center is location in the Main Port of San Cristobal Island. It is the most modern and sophisticated architectural space designed for the Galapagos natural interpretation and where you can learn about the volcanic formation of the islands, the evolution of the species, and more. See the history of Galapagos human settlements to come to understand the archipelago’s complex systems and models of management.